Boasting a 36-megapixel FX format sensor, the Nikon D800 is currently the highest-resolution “35mm size” digital SLR camera in the world. As a successor to the venerable and deservedly popular D700, the Nikon D800 offers a similarly rugged, weather sealed magnesium-alloy body and a broadly similar control layout; and adds an all-new high-resolution imager, a new viewfinder with 100% frame coverage, an upgraded Multi-CAM 3500FX auto focus module, an all-new metering sensor, a revamped Live View mode and Full HD movie recording capabilities including the ability to stream uncompressed video to an external recorder via HDMI. Other highlights include the addition of a SuperSpeed USB 3.0 port, microphone and headphone jacks, dual CF/SD memory card slots, an intelligent self-diagnostic shutter rated for 200.000 actuations, a user configurable Exposure Delay Mode, a dual-axis Virtual Horizon, a 3.2” rear display and in-camera HDR exposure blending. 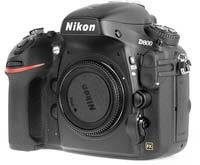 As of writing, the Nikon D800 is available body-only for £2499.00 / $2,999.95 in the UK and the US, respectively. Announced in February 2012, the Nikon D800 is the long-awaited successor to the hugely popular D700. As Nikon's second FX format digital SLR camera, the Nikon D700 has proven itself to be a great all-rounder appreciated by professionals and ‘serious amateurs' alike. Yet as time went by, pressure was mounting on Nikon to introduce a higher-resolution DSLR camera in the same price segment. The prolonged lack of an “affordable” high-pixel-count model in Nikon's camera line-up has been a cause for increasing discontent among the brand's fans, causing a number of users to eventually switch over to the likes of Canon and Sony. Still, when the first rumours of an upcoming 36-megapixel Nikon D800 started circulating on the Internet, many people thought it was nothing but wishful thinking. It sounded too good to be true - and a little alarming too. Wouldn't such a pixel-packed sensor mean a serious compromise on image quality? Were the existing lenses capable of resolving such a huge amount of detail? By February it became clear that the rumours had been true. Nikon did announce the 36-megapixel D800, the highest resolution 35mm size digital SLR camera in the world by a very wide margin. 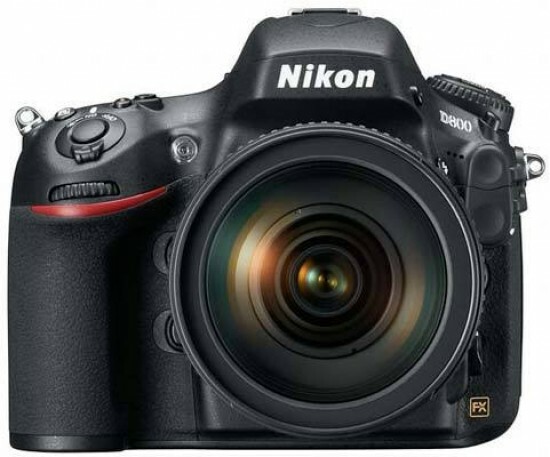 But the Nikon D800 is not simply a D700 outfitted with a crazy-high-resolution sensor and matching buffer. Nikon has added a number of refinements and features, from subtle and not-so-subtle interface changes to a new viewfinder, an upgraded AF module and an all-new video mode, among others. Outwardly, the Nikon D800 is very similar to the D700. It still features a prominent hand-grip, which appears even more comfortable than that of the preceding model. The overall shape of the camera body is rounder and more streamlined, but the dimensions are very close. Weighing in at 900 grams the D800 is roughly 10% lighter, yet it still feels reassuringly hefty in your hand. 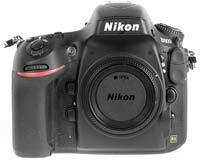 The Nikon D800's Live View implementation is different to that of its predecessor in a number of ways. Gone are the separate “hand-held” and “tripod” modes, with the D800 featuring only a single Live View mode where the mirror is locked up, and AF is performed using the contrast detection method. (Note however that unlike the Nikon D4 the D800 does not feature a completely silent Live View option, which is a bit of a pity as this was one of the things we liked most about that camera.) Upon entering LV, the mirror is raised and the lens is stopped down to the working aperture, allowing for an accurate depth of field preview. As with other Live View enabled Nikon dSLRs, there is a red rectangle that you can position anywhere within the frame, so you can focus precisely on the part of your subject that you want to appear sharpest in the resulting photo. Live View auto focus speeds aren't stellar, particularly if compared to the latest generation of compact system cameras, but are decent for a DSLR and seem improved over the D700. As far as manual focusing is concerned, you can magnify into the live view feed up to 23x - but it's worth noting that this magnified view is at least partially interpolated, which is a bit of a shame. Also, at long last, there is a live histogram - though in order to actually see it you'll need to remember to push the OK button first to enable the Nikon D800's Exposure Preview feature. Architectural photographers will be glad to hear that the optional virtual horizon has been upgraded to a dual-axis version, now showing both pitch and roll. “Movie live view” is entirely new as the D700 did not feature video recording capabilities at all. You may wonder why one needs a separate “movie live view” in the first place - the reason is simple; it enables you to accurately preview framing for videos, which have an aspect ratio of 16:9 rather than 3:2. The Nikon D800 offers Full HD movie capture at three different frame rates (24/25/30fps) and two quality levels. Additionally, 720p is also available at 25, 30, 50 and 60fps; and again at two quality settings, High and Normal. For movies, you can also choose from two crop modes, 1.1x and 1.5x; referred to as “FX-based” and “DX-based” movie formats in the manual. 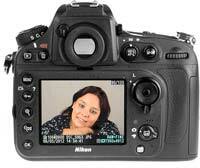 The Nikon D4's 2.7x crop mode - i.e. native 1080p footage streamed directly from the central part of the sensor - is missing from the D800. The maximum length of a clip is generally 29 minutes and 59 seconds for Normal and 20 minutes for High quality videos, unless you're using an external recorder hooked up to the camera by way of an HDMI cable. Manual exposure adjustment is available for movies - note that ISO and shutter speed are only adjustable in 'M' mode, while the aperture can be set in both 'A' and 'M' modes. The Nikon D800 features a built-in microphone but for professional-grade audio recording you'll definitely want to use an external one. In order to monitor the audio during movie capture, you can also connect a pair of headphones to the camera. As is now the norm for virtually every digital camera, from compacts to CSCs to DSLRs, there's a dedicated red movie-record button on the D800, located right next to the shutter release (much like the D4, D3200 and D5100). I personally found this button a bit too small for my tastes - your mileage may of course vary, but if you're coming from a D700, chances are you'll often push this movie shutter release inadvertently instead of the Mode button, which has been moved further to the left to make room for the new control. The depth-of-field preview button found on the front panel of the camera can be used to add indices to specific frames during recording so that they are easier to locate in the editing phase. At the heart of the Nikon D800's live view and movie live view experience is a new 3.2” LCD screen. While its resolution of 921,000 dots is the same as that of the older 3” panel found on the D700, this is an improved design that incorporates a gel resin between the cover glass and the screen itself to combat the fogging that may result from sudden changes of temperature, and also makes use of a light sensor to allow for automatic adjustment of the screen's brightness, contrast, gamma and colour saturation. In use we have found the screen to be very nice, but not quite as easy to see in direct sunlight as we had initially hoped. Of course the Nikon D800 is, first and foremost, an SLR camera - so let us now take a look at how it performs at its more traditional functions. The optical viewfinder, which is one of the most important parts of any SLR, is big and bright with 0.72x magnification and approximately 100% frame coverage, the latter of which is a welcome improvement over the 95% figure of the D700. Like the D4, the Nikon D800 comes with a Type B BriteView Clear Matte Mark VIII focusing screen, which I personally found slightly better than the D700's Mark VI screen for manual focusing. The excellent on-demand viewfinder grid display (Custom Setting d6) has been carried over from the older model. When using the optical viewfinder - as opposed to shooting in Live View mode -, you can take advantage of the Nikon D800's outstanding 51-point phase-detect AF system. Similarly to the D4, the D800 features an upgraded version of the venerable Multi-CAM 3500FX auto focus module, which boasts improved sensitivity (down to -2EV) and support for lens-teleconverter combinations as slow as f/8. In use, we have found the system to be highly capable, even in low-light situations. Under normal light levels and with the right lens mounted, the speed of the auto focus system is blazingly fast, meaning you can capture even the fastest-moving subjects with ease. Thankfully, the Nikon D700's physical metering mode selector has been retained in the D800, and is found in the same location, encircling the AE-L/AF-L button. However, the meter itself is brand new, featuring the very same 91,000-pixel RGB metering sensor as the pricier Nikon D4. Aside from being more sensitive than any previous meter - down to -1EV in 3D Colour Matrix III and centre-weighted modes - the new sensor also assists the camera in tracking subjects, detecting faces (when not using live view) and focusing. Unlike its main competitor the Canon EOS 5D Mark III, the Nikon D800 features a pop-up flash, which can also act as a master controlling up to two groups of wirelessly slaved system flashes. 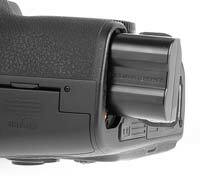 In addition, the D800 has a standard Nikon hot-shoe and an ISO 519 compliant Prontor-Compur flash sync terminal for connecting cable-contact flash units such as studio strobes. On our test sample this PC connector appeared to be poorly made, as the sync cord kept on slipping out of the socket (we've used the same cable with other cameras and never had this problem). It's quite possible though that this issue was specific to our review unit and not typical of Nikon D800 cameras in general. The PC sync socket is protected by a rubber flap, as is the proprietary 10-pin connector that sits directly below it. The latter is used to attach an optional wired remote release or GPS unit to the camera. The Nikon D800 also benefits from a host of seemingly minor enhancements, some of which are worth a closer look. Similarly to the D4, the D800 has a user configurable Exposure Delay Mode - you can now set the length of delay between mirror up and image capture (1, 2 or 3 seconds). Although the camera has a proper mirror lock-up mode too, the enhanced Exposure Delay Mode comes in very handy whenever you don't have a remote cord to hand. Another seemingly minor but genuinely important change is the way auto ISO sensitivity control works in the new model. Now you can have the camera determine the minimum shutter speed based on the focal length of the lens in use. This means that the camera may raise the ISO sensitivity if the shutter speed drops below 1/200 second when using a 200mm lens but leave it unchanged down to 1/50 second if a 50mm lens is attached (this can be fine-tuned by the user). Also new to the Nikon D800 versus the D700 is a Quiet release mode, in which mirror return is delayed until you let go of the shutter release. First seen on the Nikon D5000, this mode isn't quite as quiet on the D800, as the larger mirror is inherently louder, but it's still useful whenever a greater degree of discretion is required than usual. Still on the topic of release/drive modes, the Nikon D800 offers a maximum continuous shooting speed of 4fps in FX mode, which is a step back from the 5fps of the D700 but still a lot more than what is available on medium-format digital cameras and backs with a comparable resolution (the Leica S2 can shoot at 1.5 frames per second, the Pentax 645D does 1.1fps etc.). In fact, considering the amount of data that needs to be moved during a quick burst, this shooting speed is nothing short of phenomenal. In certain crop modes the maximum frame rate increases to 5fps (reaching 6fps in DX crop mode when an optional MB-D12 battery grip is attached). What hasn't changed is the rather clumsy way of storing and retrieving combinations of frequently used settings. The Nikon D800 has separate Shooting Menu Banks and Custom Settings Banks, and even if you use both you still cannot store all of your settings, much less activate them at the same time. This is rather strange as even the more enthusiast-focused Nikon D7000 has two easy-to-access user settings, labelled U1 and U2. While we are aware that many photographers don't use memory banks / user settings at all on their cameras, we would still love to see this fixed in a future firmware update. 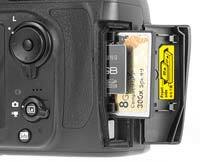 Where the Nikon D700 had a single CompactFlash compartment, the Nikon D800 has dual CF and SD memory card slots. The implementation of the two-card system is exemplary: you can tell the camera to record every image simultaneously on both cards for instant backup, designate one card to store raw files and the other JPEGs, use the secondary card for “overflow” - you name it. The camera is compatible with UDMA compliant CompactFlash, UHS-I compliant SDHC and SDXC memory cards. On the left hand flank, if viewing the camera from the back, we find a large and commendably firm, hinged rubber door that stays open until you close it - this is a welcome improvement on the much less well behaved rubber cover and flimsy rubber catch of the D700. Sheltered behind this door is a pretty extensive array of connection ports including a mini HDMI connector, a most welcomed USB 3.0 port as well as both microphone and headphone jacks. As opposed to the Nikon D4, the Nikon D800 does not feature an Ethernet port, and isn't compatible with the WT-5 wireless transmitter either. Note that in order to use the mini HDMI port you'll have to buy a separately sold Type C HDMI cable, as none is included with the camera. The Nikon D800 draws power from a proprietary EN-EL15 battery - the same kind of battery that powers the Nikon D7000 and Nikon 1 V1 cameras. In the D800, this battery is CIPA rated for 900 shots, which is pretty decent. Those that need more power and/or want to speed up their continuous shooting in DX mode might want to take a look at the optional MB-D12 battery grip, which takes the Nikon D4's EN-EL18 battery as well as the D800's EN-EL15 and even allows the camera to use standard AA size alkaline cells.